One Piece follows the many adventures of The Straw Hat Pirates, filled with a good share of danger and despair. But where One Piece really shines is in its comedic atmosphere, which fans worldwide have "tweaked" for your enjoyment! Here are 20 of the funniest One Piece memes available! One Piece is a thrilling adventure set on the high seas that's filled with tons of interesting characters. It's only inevitable that some of them are easy on the eyes, too. Here are 10 of the hottest ladies and guys from One Piece! Devil Fruit are mysterious and strange fruit found in the whimsical world of One Piece. They can either be a blessing or a curse. Find out what devil fruit are, which abilities which fruit enable, and who in One Piece has tasted these forbidden fruit so far! Ever wonder what conventions are like in other parts of the world? There's fun, fandom, and a busy schedule to be found at Kaizoku-Con 2016. We take you around one of Ireland's biggest anime events of the year. Moshi Moshi: Types of Den Den Mushi and the Den Den Mushi Ringtone! Den Den Mushi are special snails, unique to the One Piece series. They are used for communication and take the place of telephones, speakers, cameras and any other similar machine. Find out more about the types of Den Den Mushi and hear the famous Den Den Mushi ringtone below! Five Fukubukuro Fridays: Special on Lucky Bags for the New Year! Fukubukuro, or "lucky bags", are a famous New Year tradition in Japan. The name comes from the words 'fuku', meaning fortune, and 'bukuro', meaning bag. These grab bags contain random content that are often worth more than the price you pay. Come get yours, just in time for the New Year! The Supernovas of One Piece are famous and considered the Worst Generation. One Piece fans know the Straw Hat Crew, but what about the other Supernova pirate crews? Check out this guide to discover these unique crews! With over 800 chapters and each arc in a different part of the world, it is safe to assume that the world of One Piece is huge. It may be hard to imagine what the world looks like just by reading or watching the series alone. Let's take a look at the paths our rowdy crew have walked. 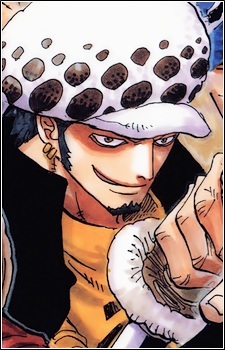 The Supernovas of One Piece are notorious rookie pirates who have caught the attention of the World Government. Get to know the infamous Supernovas of One Piece to and learn about their significance to the series below! This article offers an overview for a few One Piece games that have been released (or will be in the near future) for the Wii U, PS4 and Xbox One. If you are a fan of One Piece and games in general, then you are sure to find something that will catch your eye! As one of the Three Great Powers in the One Piece world, the Marine Admirals are a powerful team that fight against pirates. Each Admiral has his own form of justice as well as unique, unmatched powers. Learn more about the One Piece Admirals in this guide! One Piece may be the story of a boy who wants to be the Pirate King, but it's also a rollicking adventure on the high seas. It's an emotional roller coaster filled with high points and low points and when One Piece hits the low points, be prepared for tears. Here are 10 sad moments from the series! One Piece has many relationships between different characters that are deep, meaningful, and touching. One of these relationships is between Trafalgar Law and Rosinante Donquixote. In this article, we'll dive deeper into the relationship and what it was truly all about. One Piece follows the journey of Monkey D. Luffy and his quest to become the Pirate King. He forms his crew called the Straw Hat Pirates and travels through the Grand Line. Here are 20 of the absolute cutest moments from Luffy and his gang!